CENTRAL QUESTION: How true is anything that only one man believes? Nathan Englander may be the only writer on Amazon whose fans claim he was recommended by God (with the possible exceptions of Matthew, Mark, Luke, John, and Muhammad). Englander’s debut short story collection, 1999’s For the Relief of Unbearable Urges, made him the messiah of Jewish fiction by simultaneously updating and preserving old-country questions of faith. 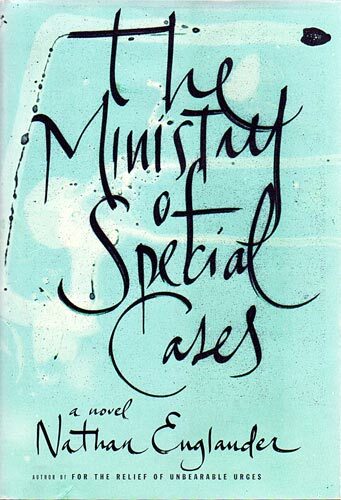 The Ministry of Special Cases, his first novel, should make believers of whatever skeptics remain. Set in Buenos Aires in the ’70s, The Ministry of Special Cases follows the hapless Kaddish Poznan. As the only child of the town’s Jewish brothel willing to admit his unsavory provenance, Kaddish gets paid by the other hijos de puta to remove their surnames from the official Jewish cemetery for pimps and whores. Along with his wife, Lillian, he spends most of his time bickering with their nineteen-year-old son, Pato, a left-leaning university student. He’s so involved in his two roles—attempting to maintain his authority by day and erasing the community’s history by night—that he doesn’t notice when his government begins to undertake the same dual task. Argentina’s Dirty War, which began in 1976 and lasted seven years, was less a battle than a purge by a paranoid government of anyone even remotely connected with the left. Going in, a general predicted, “We are going to have to kill 50,000 people: 25,000 subversives, 20,000 sympathizers, and we will make 5,000 mistakes.” Humanitarian groups put the actual number of the Disappeared, as they’re known, at around 30,000. When Pato goes missing, Kaddish and Lillian join the thousands of parents trying to recover a lost child. The book’s horror is less about violence than about the emotional torture only a bureaucracy can inflict. The Ministry of Special Cases begins where Kafka’s functionaries left off in The Trial. The building is guarded by a man who has no problem beating people to death but can be bribed out of violence with small pieces of chocolate, and staffed by incompetent employees who unblinkingly release abused, frightened teenagers to the wrong anxious parents. Literary fiction is rarely this harrowing. Like the film Pan’s Labyrinth, also about insensate authority, the book presents a nightmare world even as it asks you to hold out hope that things aren’t really so bad. But there’s no fantasy here; instead of Pan’s magical, pre-Christian underworld, there’s only Lillian’s humble dream that her son will come back.The narrative maintains the momentum of a thriller under the pall of a tragedy: either Kaddish and Lillian are racing to save their son, or they’re wasting days trying to bring back a long-dead boy. The resulting tone is a peculiar blend of suspense and futility that gives the book intense forward motion but prevents any possible resolution. Early in the book, Kaddish finagles free nose jobs for his entire family. Pato refuses the offer, but both of his parents indulge, thereby losing their Jewish looks and destroying any family resemblance. (Later, officials will claim there’s no way the missing Pato could have come from such handsome parents.) Englander’s greatest strength comes from this ability to mix contemporary concerns with ancient fears. In The Ministry of Special Cases, he takes two outcasts from a small, marginalized religious community, sets them in another country’s deliberately occluded past, and makes their plight terrifyingly universal. Izzy Grinspan is managing editor of Jewsrock.org, a website about Jewish rock stars.